Like something plucked right out of a 1960’s sci-fi flick, the model of a Driverless bus wowed visitors at the Science Museum in London - where it is currently on exhibit - with its claims of reducing air pollution and traffic congestion, wrapped up in a slick, futuristic package. the extraterrestrial-like ‘pod’ reportedly utilizes state-of-the-art technology to ‘sniff’ out magnets embedded in the roads in order to navigate through the main routes before maneuvering onto residential areas. Using a mobile phone, one would be able to hail the bus and direct it towards a location of their choice. 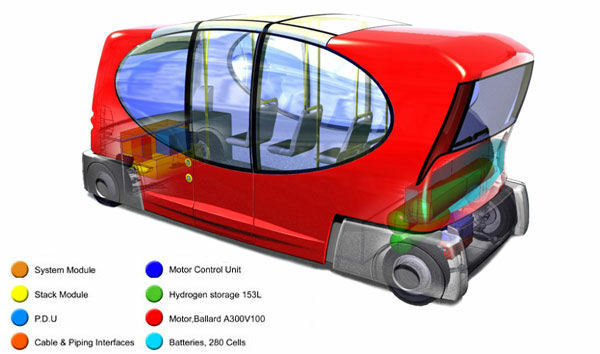 The bus would not only reduce operating costs by up to 50 percent, it would also enable a more time-efficient means of public transport. Yeah, that'll never catch on here. Bet it'd go down a storm in Tokyo though. Capoco are hoping to have 'em ferrying us around in time for the Olympics. We won't hold our breath as it's a safer bet they'll end up downgrading to old Routemasters and a fleet of Green Goddesses once the 2012 infrastructure crumbles. Check out the mobilicity website if you want to keep dreaming.